I too was a BBS addict when I was young (early 90’s), before I had access to the internet. Once, when I was about 11, a friend told me about this cool BBS he found that allowed you to play DOOM with strangers. I tried it at his house and it was pretty awesome, so I copied the connection file from his copy of ProComm Plus onto a floppy and transferred it to my system. I did something similar from my grandma's house once, I had multiple dialup ISP numbers on my laptop and used the wrong one by accident for several hours one weekend, wasn't $500 but it was a sizable amount of money. The long distance call is something few people younger than my generation will have any concept of. I can call anywhere in the country for free and even international calling is cheap today, or free with various VOIP options. I've heard of WIFI modems, but that honestly defeats the point for me. I would prefer to use original modem hardware and tap into the regular POTS system with no telnet involved. I know extending the point where it hits the internet to a telephone adapter might seem a bit stupid, but it's just my preference. "regular POTS system" is a dying breed. Many local telcos don't even know how to order a copper line. Personally I agree, however Im in Aus and via the net I can access BBS's all over the world without paying international call charges, so WiFi modems win it for me. In Australia, they don't exist anymore. With the conversion over to the National Broadband Network, all legacy services such as ADSL, ISDN and analog phone lines will either need to transition over to the NBN (in the case of POTS lines, all calls will be routed over VoIP) or simply disconnected. I dare say a similar thing would have been happening in the USA. Even if your direct area isn't impacted, you also need to think about the remote end. If it's still possible, maintaining POTS at either end costs money and while you might find some larger BBSs still have dial-in support, the question remains, "for how long?" I love the sound and experience of an old modem just as much as the next person (I didn't back then), but for some things, you just need to move on to modern techniques. Eh, it wasn't that expensive of a device, and I definitely have other uses for it. Heck, my modem has very useful voicemail functions, and the number is isolated from the ones I use, so perhaps I could use it as some sort of telephone robot or answering service for future needs. Who knows. I'm not quite done experimenting, as my successes are quite close, and there is still room to do so, but it's just an attempt to see if I can run this old technology in the modern day. My next, or perhaps current? Project is a tad newer. More than a tad actually, it's an AMD Athlon 64 FX based computer on the nForce 4 Socket 939 platform. I put the specifications down here, but safe to say I have had two DOA motherboards in a row, and my third one is taking 10 days to get here (coming within about 12 hours of this post). Hopefully it's interesting, but some people tend to have a varying definition of the word "vintage" even though it's been talked on here to just mean from a certain year (like wine). The video reminded me of something from my high school days. The computer lab was Apple II's, some actual Apples and some of those black Bell and Howell models. We had an ordinary dot matrix printer, an Epson or similar, but there was also one leftover relic, a Teletype Model 43, with an acoustic coupler, and there was a live telephone right there. They also had it hooked up to one of the Apple IIs as an extra printer. First up, this model still had a physical bell that rang with Control-G. So I wrote a convenient program that mimicked the ringing of a telephone. When we had a substitute teacher, it was basically free lab day, so I set this up on that machine, and then moved over to a different one. I had a time delay built in so it wasn't obvious. Ring ring, ring ring... a few rings then it would stop. Sub came in, picked up the 'ringing' phone - nothing but dialtone. Few minutes later - repeat process. But, relevant to this thread, we found out the phone line was a dedicated POTS line, didn't go through the main office switchboard, so we could call out or do whatever. So my friend and I would spend a lot of time on some local BBSes. Several boxes of 11x17 greenbar fanfold paper later... For whatever reason I kept much of this as a log of what I was doing, not that any of it was really earth-shattering, but I had all these long printouts for a while before i finally tossed it all. At home I was getting on the same boards with my TRS-80 Model 4P, and in fact had one of the modems shown in the video, direct connect to the phone line but manual answer/originate and no dialing capability. Another friend of mine actually modified one of them so that it could auto-answer, he had TRS-80 Model 1 and write, in all assembly, a purely memory-based BBS system - all message threads were completely stored in RAM, no disk files whatsoever. In those days, 300 bps wasn;t necessarily the limitation on communications speed - except on his board, with everything in RAM and the code being assembled machine code, it could send a steady 300bps with no delays. Wish I still had all my code - I wrote several systems in BASIC on my 4P, including one that did matchmaking based on answers to a range of questions each new user had filled out - long before Match.com or any of that stuff. If I still had the disks and code, I coulda sued them LOL. Good times. Computers weren't nearly as useful back then but they sure were a lot more fun. Talk of the Apple II's and dot matrix printers reminds me of using Print Shop on the ones in my elementary school classroom to print out huge long banners on fanfold paper. That's something that seems to have virtually disappeared, despite there being no real practical reason that a modern inkjet printer or even a laser printer couldn't print from a continuous roll of paper. I actually have a dot matrix printer and could do that if I wanted. Would look like crap by today's standards, but the point is I could make a greyscale banner with it. I was actually wondering how practical it would be to hack the printer so it could use colour ribbons. Might be an interesting idea for me to try out at a future date. The first web browser was a command line program called "www" which ran on Unix. It was written by Tim Berners-Lee (timbl) at CERN for NeXt and Unix. At the beginning they were rarely used over modems because at first the Web was confined to the research community who tended to be in academic, government labs, or corporate settings, The first browser to support inline graphics was probably XMosaic, which was written by Marc Andreesen (marca) at the National Center for Supercomputing Applications, or NCSA. It ran on Unix workstations. The NCSA web server which later on became "a patchy server" (Apache) was written by Rob McCool. At the beginning it was difficult to get a TCP-IP connection to the net. People who had them were very lucky. I've still got 2, one is even colour! 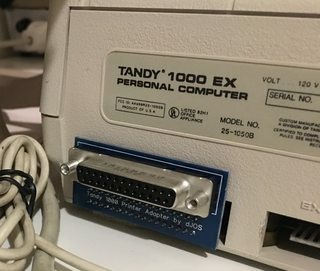 I even designed and built an adapter so I could use them again (and LPT sound cards) on my Tandy 1000 EX. Btw, fanfold tractor feed paper is horrendously expensive now. It was crude, but colored text and line art came out pretty darn nice! This was at a time when color bubble jets still cost thousands of dollars, so bringing in color printed homework (with images from Encarta or Brittanica on CD-ROM) was impressive as hell to my teachers. Man, I loved that printer. It was soooo much quieter than the old Epson 9-pin it replaced. That thing was like a freaking machine gun! I have an NEC something or other AND a box full of paper sitting here under my desk - it goes with the PC-8801 I have set up on top of my desk. Perhaps some who owned a TRS-80 of some sort (the Z80 based ones, not the Color Computer or later MSDOS machines) may remember a program they had called DOTPLOT. Since the graphics resolution of the basic TRS-80 (unless you installed the hi-res board they had for the Model III or Model 4 (one thing I wish I had but never did), this program allowed you to use a dot matrix printer as a high resolution 'display' to plot out equations and systems of equations. It made some pretty awesome printouts, but talk about noise - and since it always used bold, it ran through ribbons rather quickly. I have a Commodore dot matrix printer but the ribbon needs replacing. I've been meaning to do it. I'm guessing new "original" ribbons would be hard to find. I've heard of "refilling" them yourself, has anyone tried this? My 6th grade teacher had a little gadget for re-inking printer ribbons. I don't recall how it worked exactly but I think it just ran the ribbon through a little puddle of ink as you cranked it. I remember doing that by hand, the kit came with a plastic 'glove' so you wouldn't get ink all over your hands.